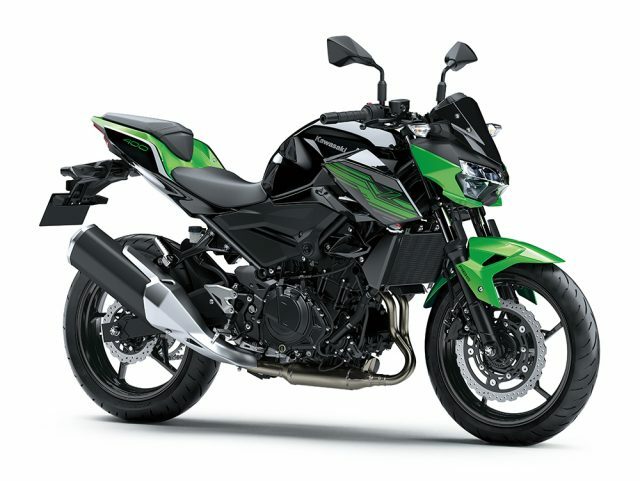 The latest addition to Kawasaki’s Z Series, the Z400 was designed to be a real Supernaked machine. Developed in parallel with the 2018 Ninja 400, like its Ninja counterpart the new Z400 offers significantly improved performance care of all-new high-performance engine and chassis. Keeping sugomi * performance in mind, both engine and chassis tuning were optimised for a Supernaked package. Compared to the Z300, the new Z400 offers lighter handling and stronger low-end feeling – a rider friendly combination ideal for fun, nimble street riding. Matching its exciting performance, the Z400 is clad in aggressive new styling. Inspired by the sugomi styling of the flagship Z models, all-new bodywork blends the designs of the Z650 and Z300 to deliver an aggressive, agile, masculine impression. Whether deftly navigating the urban jungle or parked strikingly on a street corner, this lightweight, powerful Supernaked is sure to turn heads.